Now that we are in the middle of winter with cold, rainy days my heart craves for bowls of steaming country stews because it fills me up and warms me right through to my toes. In France a simple country style dish is often referred to as Campagnarde, as in a dish that emanates from the heart of the countryside with loads of flavour but no fuss or decoration. 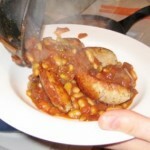 The recipe I made this week is made with Flageolets verts, French green kidney beans which are full of fibre and protein, cooked in a delicious tomato, onion, herby sauce and topped with some yummy herb sausages (Bratwurs) from my local Gardens Centre butcher (Raiths, they are the best in Cape Town). I could visualise in my mind cooking my recipe this week over an open fire, in the middle of the French countryside with some good friends, eating this casserole accompanied by lots of crusty bread and pitchers of fruity red wine, however I chickened out of the outdoor cooking, but I reckon there are lots of hardy S Africans who would enjoy cooking this in a pootjie over a braai. The wine I would recommend to serve with this is a Chateau St Cosme Cotes du Rhone Rouge, a tasty shiraz from the southern Rhone Valley. • Eat while hot accompanied by some crisp baguette to mop up the sauce. 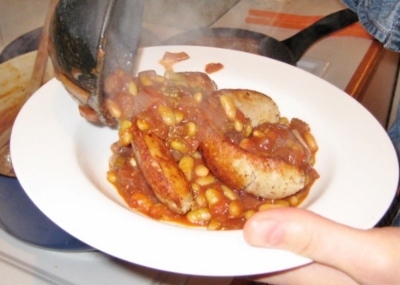 Serve with a glass of Shiraz from chateau St Cosme in the southern region of the Rhone.